In Part I of this article we discussed the importance of socialization – the process of familiarizing your parrot with the people and things that make up its world. Wild parrots are socialized by their parents, mates and flock members, but most or all of these important individuals may be unavailable to captives. 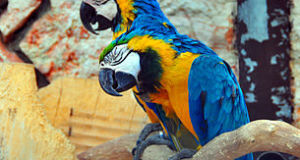 Un-socialized parrots generally live stress-filled lives and remain fearful of people. Today we’ll take a look at some simple and effective socialization techniques. Although it seems almost “common knowledge” that hand-raised chicks pulled early from the nest make the “best pets”, this is not actually the case. Ideally, chicks should be raised by tame, socialized parents – this gives them a great start in life, and saves much time and trouble later on. Nestlings taken from their parents too soon may bond with a single person but often suffer from behavioral problems. 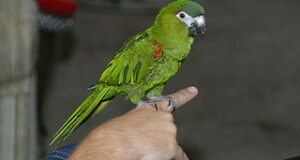 As a general premise, socialization techniques expose the parrot, in a non-threatening or even attractive way, to numerous people and to the everyday and unusual situations and things that the bird will eventually experience. Parrots so prepared tend to take surprises in stride – new situations may be viewed with suspicion, but will not cause undue stress. An important aspect of socialization is preparing the parrot for fearful encounters such as being wrapped in a towel for feather trimming or placed in a carrier for transport. Introduce your parrot to towels by treating them as playthings – try different sizes and colors and use a towel to hide favored treats or toys. During my time as a zookeeper, it was common practice to use carrying crates as nest boxes or feeding stations for all types of animals. Doing so was much easier than just showing up with a crate when an animal needed to be transported somewhere. Introduce your parrot to its crate by leaving it near the cage for a week or so. Eventually, try placing treats and toys inside the crate when the parrot is at liberty. Be sure to include a perch, as the addition of one at the last minute can short-circuit your efforts. 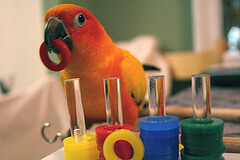 Once your parrot is well adjusted to its home environment, begin to slowly introduce some “surprises”. You might try wearing various coats, hats (some folks swear by wigs!) goggles…anything to prepare the bird for changing conditions. If a particular item really “throws” your bird, try leaving the offending object in sight, but not too close to the bird. Handling it, and allowing the parrot to approach on its own, may also help. Do not leave stress-provoking objects (or people!) nearby while you are not present, or if the parrot seems overly-anxious. 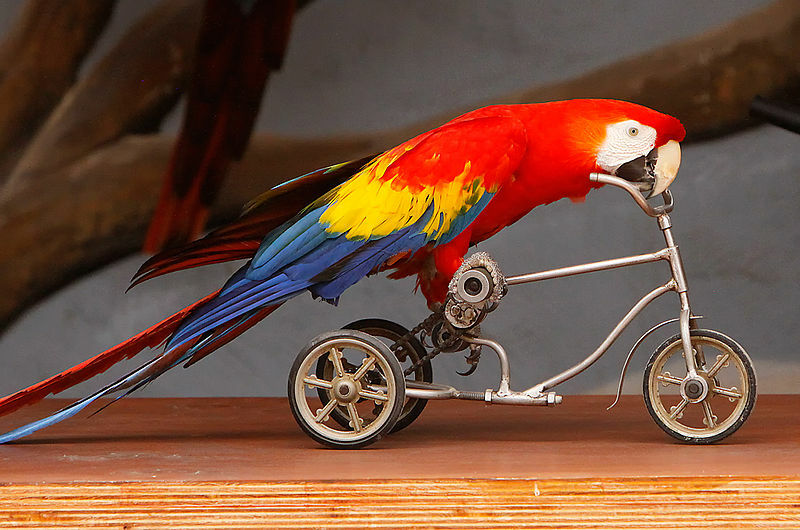 Strangers are particularly frightening to parrots, especially those that live with single individuals. This can create quite a problem at the veterinarian’s office or if the bird must be cared for by others. Introduce your parrot to as many people as possible, but do so slowly. If a visitor is in a hurry, have that person just stop by the parrot’s cage…rushed contacts will do more harm than good. At other times, have strangers offer treats to the bird, but watch your pet’s reactions carefully. If it is frightened or aggressive, just let the bird observe the visitor, but do not force contact. Learn about the socialization process in wild African Gray Parrots here. This was an article I needed to see and hear. I agree wholeheartedly about the stress of living in a human environment for many parrots. Living with 6 neurotic buddies, each having their own triggers and being their only handler makes it challenging to get them over the hump. One of the techniques I use successfully is chamomile tea if I know in advance there will be disruption to our schedule. I will use one tea bag per 2 quarts of water as their drinking water a few days in advance of knowing there will be a major disruption in their lives. ie my grandchildren coming to stay or a new bird entering the mix. I learned of this through the site landofvos and it has helped us get through difficult times.